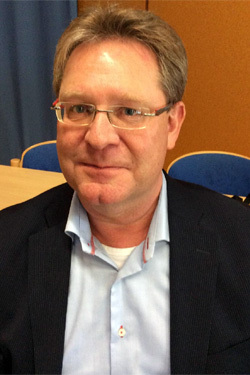 Prof. dr. Oscar P. Kuipers received his PhD in 1990 from Utrecht University on protein engineering. He then moved on to study genetics, physiology and gene regulation of Gram-positive bacteria, both the good- (dairy, enzyme production) and the bad (pathogen) guys. He is a nationally and internationally recognized leader in the field of antimicrobials, bacterial cell biology and bacterial gene regulation. He has a keen interest in developing new classes of antibiotics to fight the ever rising number of antibiotic-resistant pathogens. Therefore, he employs a wide range of approaches and technologies, including genetic engineering, synthetic biology, single cell analyses by fluorescence microscopy, genomics technologies, biochemistry, genomics/bioinformatics and high throughput screening assays. He also is supervising iGEM teams during the last 8 years, which were quite successful. Microbiology, Genetic Engineering, Antimicrobial Research. The Molecular Genetics Research Group focuses on physiological and genetic research on Gram‐positive bacteria. The group harbours scientists of over fifteen different nationalities, has a great atmosphere and organizes regular societal events such as international dinners, parties and lab-outings. The researchers commonly work in small multidisciplinary teams that have access to a wide range of research facilities and have regular meetings. The group benefits from a good number of national and international (EU) grants and has a broad interest, ranging from host-microbe interaction, via bacterial differentiation to the design of novel bioactive molecules. One of the growing areas of research is on developing new antimicrobials for human health. In this research project we will also collaborate with renowned lantibiotics researchers from Ireland (Teagasc) and from Heinrich Heine University in Dusseldorf.